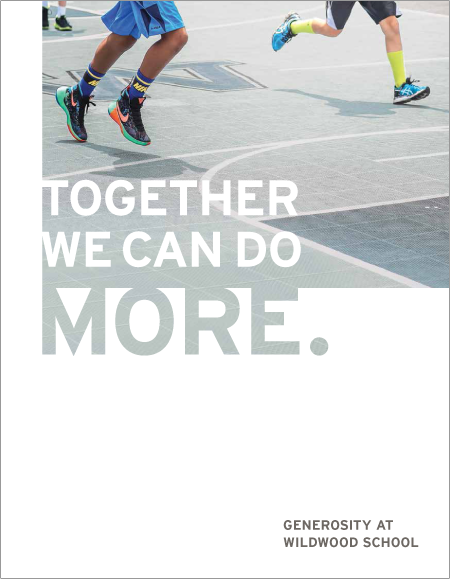 In this donor-focused brochure, "Together We Can Do More," Wildwood School sets out the history of generosity on the part of families and friends, who support the school's efforts to create brave learners. Design: KBDA. At Wildwood School, we not only nurture brave learners, we inspire brave givers. Giving at Wildwood involves our entire community, united in the knowledge that a Wildwood education changes the world for the better. And you make this transformative journey possible. As part of Wildwood's giving community, you help provide the critical 10% of our budget not fulfilledby tuition. Together, we are shaping the future of education. Your generosity is the fuel that enables us to experiment, seed new ideas, and share what we've learned with a broader community. The stories in these pages illustrate the powerful impact of this generosity. Education Multiplied. Supported by Annual Giving, internships are part of the core curriculum for Wildwood juniors and seniors, aimed at extending learning beyond the classroom and encouraging exploration. Sophia Poulos '10 has always been "a Lincoln Logs, Lego kind of girl," she says, fascinated by what makes structures strong and why they fail. So her internship following her junior year at Wildwood was "awesome." Sophia spent the summer working with the Network for Earthquake EngineeringSimulation (NEES) at UCLA, an eight-week opportunity that turned into a six-year relationship. NEES@UCLA, funded by the U.S. National Science Foundation, specializes in mobile testing of structural performance. "It was an experience I wanted more of," Sophia recalls," which decided my path on engineering." In her final year with NEES, she came full circle, serving as intern coordinator. In 2016, Sophia earned her bachelor's in engineering science from Smith College in Massachusetts, which led her to study for a master's in structural engineering at the University of California, Davis. Through it all, Wildwood's strong foundation in collaboration, she says, "put me ahead of the game." Annual Giving impacts every person and program at Wildwood. Parents, grandparents, faculty, staff, alumni families, and friends all contribute. The power of these gifts advances outstanding programs, such as student internships, and helps ensure a brilliant future.